As you might have noticed from my post two days ago, I did not reach my goal of reading 35 books this year, but I figured the books I did get a chance to read might be worth mentioning. I'll talk about my favorites, but generally, if I took the time to read it and mention it, I probably liked it quite a bit! Filed under my favorite blogs of all time, I started reading Suri's Burn Book, the blog, during my senior year of high school. Viewing tumblr blogs wasn't blocked on our computers at the time, so I would sit and scroll through pages of Allie's—ahem, Suri's—content. To put it short, Allie Hagan comments on and criticizes the children of Hollywood royalty, all while writing in the POV of our dear little Suri Cruise. The blog was transformed to an equally as hilarious book that I plan on starting to gift to everybody because it's just that fantastic. I've read it, my mom read it, most of my aunt's have read it, as recommended by my mother. Check out the blog version and order yourself a physical copy as well while you're at it. I promise you won't regret it. I did a whole post about how I felt about this book. I'll link it right here. I've done a post on this book, so if you'd like to check that out, I'll leave it right here. I've also talked about this book, so if you haven't read the book yet, do it. I highly, HIGHLY recommend it. Also, I'll leave the donation page here as well. DON'T EVEN GET ME STARTED ON MINDY KALING. I think I've talked about this book to death, so do yourself a favor and GO BUY IT. Man Repeller was the first fashion blog I started reading religiously (I used to read this during class during my senior year when I was caught up on Suri's Burn Book, right Aly?) and it pleased me to end when I saw that Leandra Medine was releasing a book. As soon as it was available for pre-order, I told my mom that I not only wanted it for my birthday, but I needed it. Flashforward to this past summer when I actually had time to sit down and read it...this book was nothing short of hilarious and entertaining and insightful. Read Leandra's blog here and order yourself a copy of this wonderful tale of my favorite man repeller. This book is half fiction, half personal essays by Marina Keegan, a Yale graduate. Sadly, she has since passed away due to a car accident five days after her college graduation in 2012. These are some of the works she wrote during her time at Yale. Another book that I really do strongly recommend, especially if you're a young writer yourself. You can order yourself a copy here. This. Book. Kicked. A**. I read it on the 9+ hour car ride to Delaware over the summer and absolutely could not put it down. It's inspiring in every single way and definitely gives you a hefty dose of female empowerment. I loved it so much that I actually FORCED my mom to read it whilst on vacation as well and guess what? She loved it just as much, if not more! I think on behalf of both of us, every woman should give this book a read. Katie Heaney is a writer for Buzzfeed, hilarious, and probably my new best friend without even realizing it. I read this book, surprise, on the beach! I've never related more to a book of personal essays more, even Mindy Kaling's book, bless her wonderful soul. Please, if you do anything for yourself this weekend, pick up this book. Favorite book of all time. That is all. Read this book in a total of four hours without stopping. Even with the aching in my bum (I read it on a long bus ride from Cleveland to New York City), I still managed to laugh and cry and fall in love with a fictional set of characters. Hands down the most twisted and most beautiful book I've ever read. All of FLB's books are, though. Another one of my favorite books, even today as a young adult. I like to pick this book up when I'm feeling particularly nostalgic of my childhood. What's your favorite book that you've read this past year? 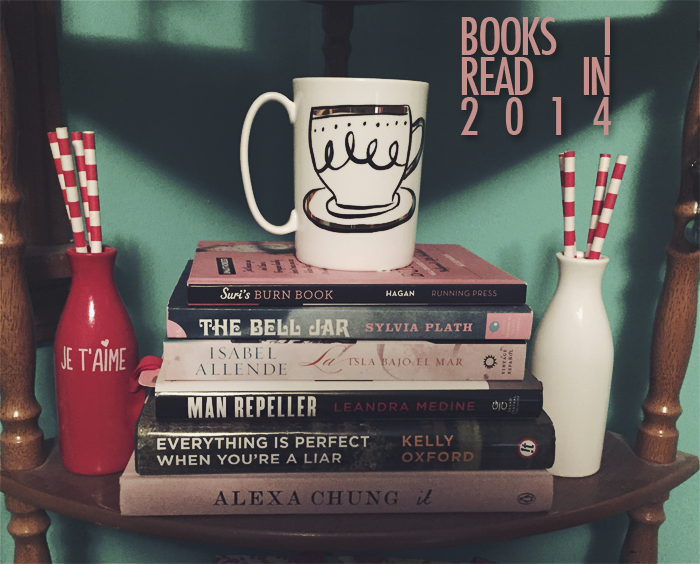 What do you plan on reading in 2015?